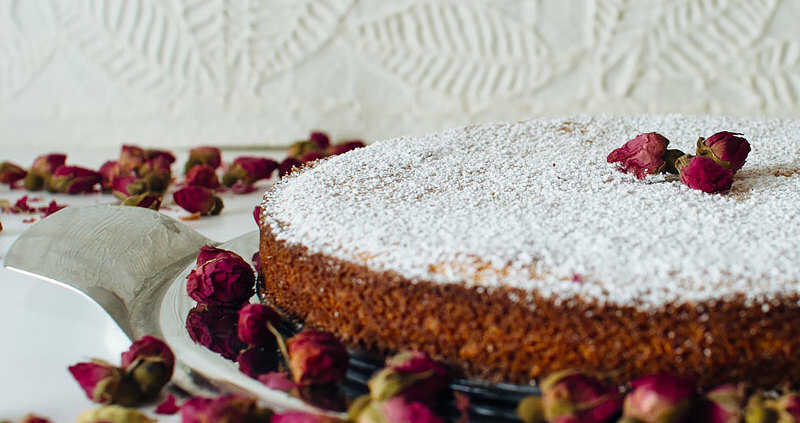 It’s like cornbread and cake had a delicious, floral baby! I love the texture that cornmeal adds to cake-y things. I even add it to my pancakes for that added little crunch. 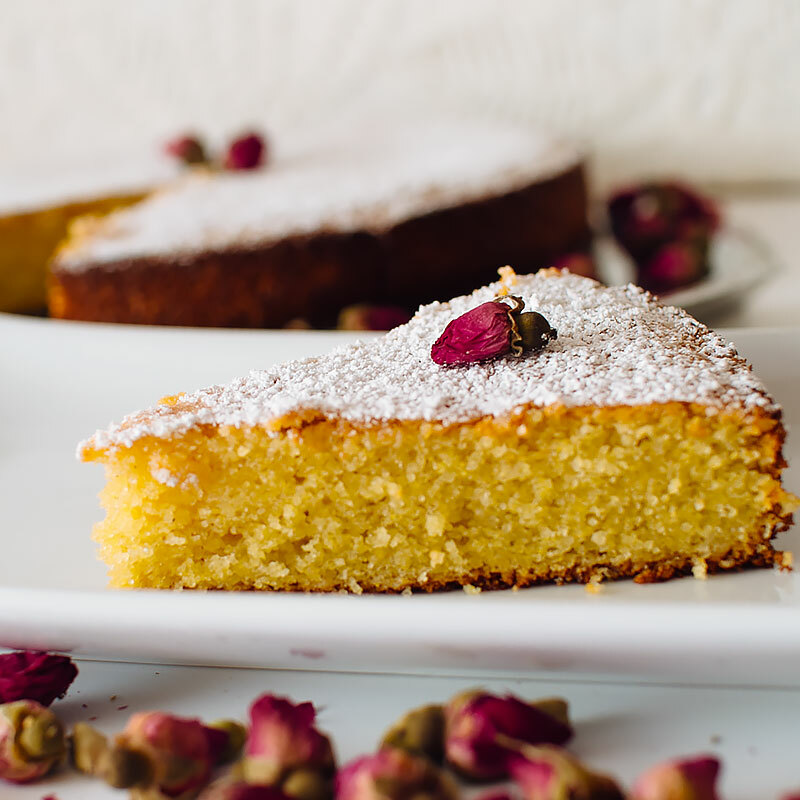 If you don’t have cardamom or rose water on hand (I know, I know), this cake is flexible enough to take on pretty much any flavor that tickles your fancy. Almond or orange extract would be great (1 tsp should be good), and any warm, sweet spices like cinnamon, nutmeg or star anise. Experiment! I used rose water and cardamom because I just made a trip to the Indian market and bought a bunch of random infused waters and spices. 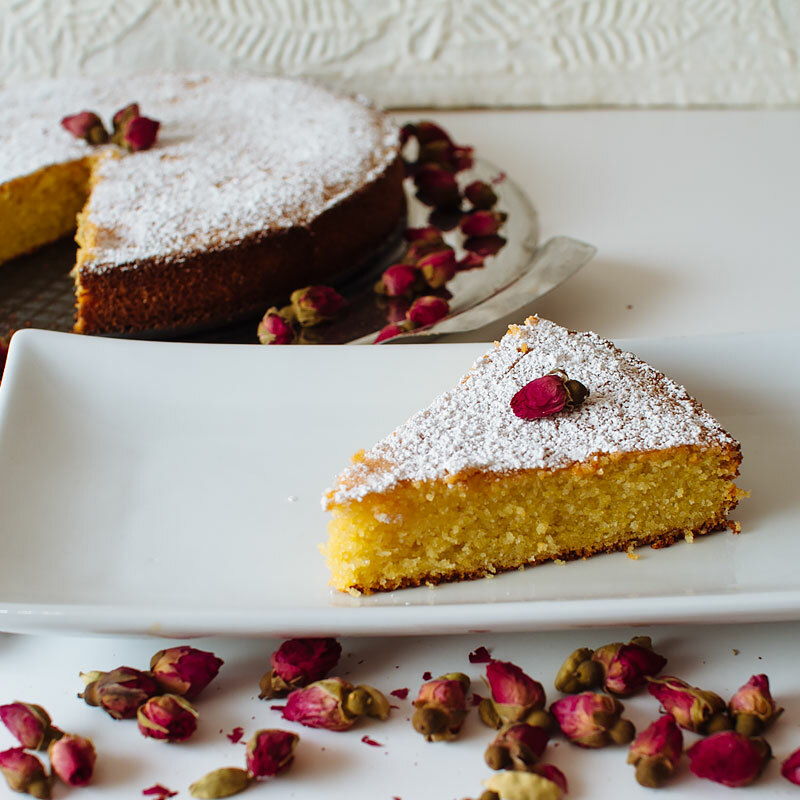 I felt like the cardamom and rose water would compliment each other well, and they sure did! Did I mention this cake is gluten free? There’s no wheat flour involved – just almond flour and cornmeal! If you can’t find almond flour, make your own by grinding up about 1 cup of almonds in your food processor. Be careful not to over process, or you’ll end up with almond butter. Just pulse until it looks like fine cornmeal. David Lebovitz has a great almond flour FAQ post. My apologies for the lack of step-by-step pictures that usually accompany my posts. 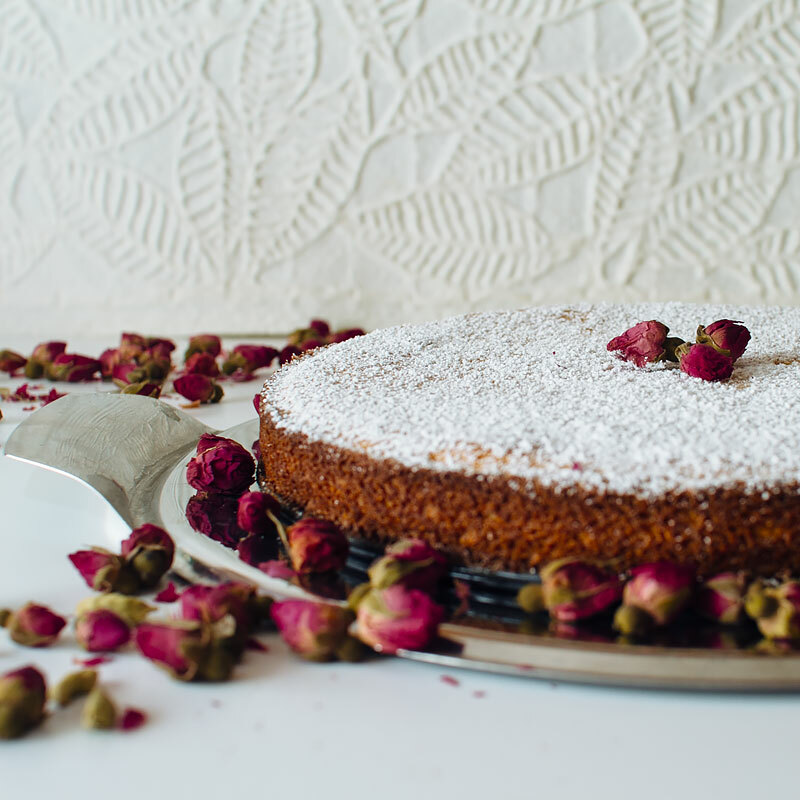 I made this recipe one night because my sweet tooth was throwing a fit and I needed cake, STAT. I never planned on posting it, I just wanted cake! Once I sliced into it and tasted it, I knew I had to share it with you. I found dried rose buds for tea at the Persian market. I have yet to use them for tea lol. 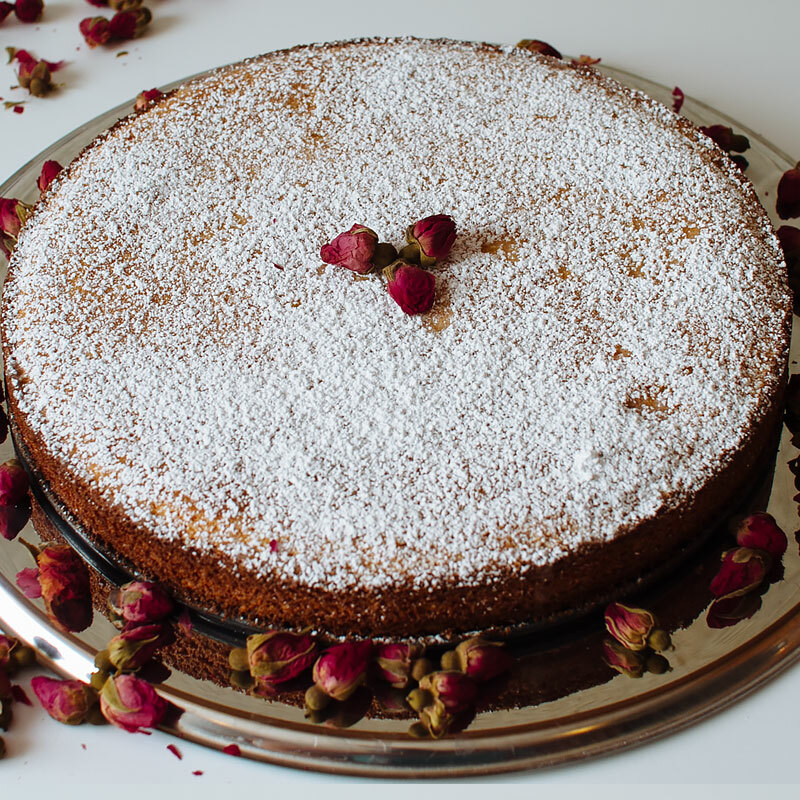 An easy, gluten free cake. Lightly oil or butter an 9" spring-form baking pan or cake pan. Set aside. In a large bowl, beat the butter with a hand mixer until light and creamy. Add in the sugar and beat until fluffy, a few minutes more. Add in eggs, one at a time, mixing until fully incorporated after each addition. Add in greek yogurt or ricotta, almond flour, vanilla extract, rose water and cardamom and mix well. In a separate bowl, combine the cornmeal, baking powder and salt. Fold into the almond meal mixture. Pour the cake batter into the prepared pan and bake for 35-40 minutes, until set. Allow the cake to cool, then remove from the pan. Combine the confectioners sugar and citrus juice. Add water to achieved desired consistency. Pour glaze over the cake and let set a few minutes before serving. If desired, dust with additional confectioners sugar. It’s the perfect little cake to just have around to snack on!! Thanks, Cece! And it’s so easy to whip together! Questa è una torta bella e semplice!